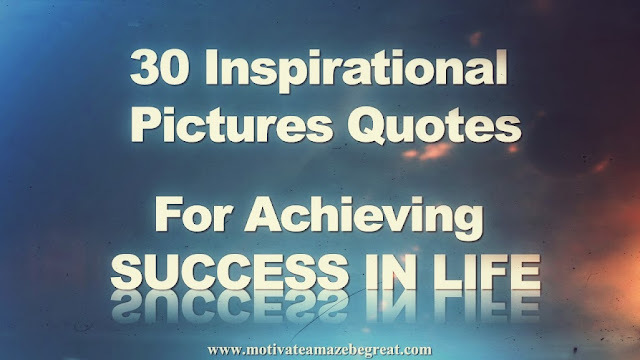 30 Inspirational Picture Quotes To Achieve Success in Life - Motivate Amaze Be GREAT: The Motivation and Inspiration for Self-Improvement you need! Sources of inspiration and motivation are everywhere in our life, we just need to take the time to acknowledge them and let them inspire us to achieve success. The lyrics from a song, scenes from a movie, things we see daily, blog posts, tweets, motivation and inspiration can come from any source. Inspirational quotes are one of those forms. We present you 30 Inspirational Picture Quotes on Success for you to achieve greatness in your life. Enjoy! Our take: Don't waste time doing useless things that won't get you nowhere near happiness and success. Spending time on negative thoughts will blind you from the positive ones in life. Our take: See your failures as progress towards success, not the antonym of success. Replace failure with progress in your success dictionary. Don't quit until you have found the way that works. Our take: If you had a great moment in your life don't bring negative feelings to the table. Instead, use those past memories as an inspirational source for motivation and happiness in the present. Our take: Don't get it twisted, knowledge it's necessary to be successful. Get to know what you have to do in order to achieve what you want. Read inspirational books, but also the technical ones. Our take: Life doesn't stop just because you had a good or a bad day, it goes on. Life doesn't stop.! Both bad or good days, aren't there to stay forever, motivate yourself for what is coming. Our take: Be honest and have integrity in your life. If what you see and what you tell people are the same, you don't have to make up stories in your head. Use your time properly with inspirational tasks. Our take: There's a strong correlation between what people's mindset is and what they achieve.in life If you want success, think and act success. Make your mind up about what you want out of life. Our take: Don't emulate others or try to please someone by being what you aren't in life. Be yourself because it's there where the unique personality and real success potential are. Our take: People follow examples they don't follow words. Stop complaining about what's wrong and do something about it. Inspire and motivate people with your actions throughout life. Our take: Forgiveness is a must. It will annoy your opponents but also it will give you unbeatable peace of mind to do others things. To be successful you need to focus on what really matters. Our take: Different people, different beliefs, they give different meanings to the same thing or event. If you want to see as clear as you can become the best you can be by developing your mind. Our take: It's simple to be yourself, but it's not easy in a world where negative people bash you all the time. So, you can reach success and be a successful person, if you manage to remain yourself despite all the negativity. Our take: Love is supported and inspired by friendship type qualities like, respect, admiration, altruism. When they are gone, love becomes weak and eventually subsides. Our take: Success it's about building character. Pretending it's about building a downfall. It's better to be yourself and deal with all the trials and tribulations because they will strengthen your character. Our take: Life can be amazing, like motivational speaker Les Brown once said you can shoot for the moon and not reach it, but you can accidentally land among the starts. So effort is always rewarded. Our take: Don't give up on your dreams just because you think their gone. You can change that particular situation now. It's only late in your mind, so forget that! Remember your dreams, get inspired and motivated by them. Our take: When you do it for you, maybe you postpone things for later; but when you do it for someone else, you do it now! Loving someone deeply gives you unbeatable motivation and the strongest why of them all, to be successful. Our take: We all come up with excuses in our mind for not being successful, motivated or inspired. But most of the time we already have the resources we need, it's a matter of seeing the value in small things. The greatest achievements in history came from the cleverest use of small resources. Intelligence and creativity are a must have and use. Our take: Plain and simple, that's how things in your head must be in order to succeed. But to do that you must master you craft better than anyone. Put in the hours of work and study. Preparation is essential, so when time of crisis come, you already know what to do. Our take: You already know who you are and what you want to become. The thing here is to bridge that gap. You do it by executing the necessary actions you need to do to grow inside. So you are building yourself, in essence success it's not about having things, but becoming someone better. Our take: People say "I need to get motivated to go to work", "I need inspiration to this job"...maybe they are wrong on the part of the equation they have to change. Maybe they need "A work that motivates them" or "A job that inspires them". Do what you love, love what you do, motivation and inspiration will be there certainly. Our take: We can't explain the universe. But we can say there is some force that drives things to happen whenever you show to the universe what you want. So, showing what you want, by planning and taking action towards it, are major steps into being successful, Think this way: how can the universe know what to give you if you don't express what you want? Our take: We must do it ourselves. We are responsible for it, we can't play the blame game and put on someones shoulder. This quote portraits the mindset of a creativity person, this is how new books and ideas come forward and inspire the world. Our take: Friends, people you can count on any occasion, they are rare and you can count them with only one hand. Preserve them, people who push you, motivate you and inspire you. Do the same for them. Our take: Who you are is in fact the starting point of being successful. Sometimes we make it the finishing point "I'm this and that's it". No! No! You have to know really well who you are, so you know what you have to do in order to become who you want to be. Our take: Negative feelings, like resentment, hate, revenge, can consume you, they always come back at you. You get what you give, be a source of inspiration and motivation, know what you want and provide people with it, because it will come back at you. Our take: Deep thoughts and word game at their finest. Everything is possible it's the mindset we need to have, because even the opposite word of possible contradicts itself by saying I (a)m possible. Our take: At times we think happiness just happens, it's some sort of magic or flow of the day. And unhappiness also, in fact some people think they are destined to be unhappy. But it's the way we think and the way we act that really dictates if happiness it's there or not. The simplest actions that we don't even bother to work on, can give us happiness and joy. Our take: This is so inspiring! Be courageous, dare to dare, be committed to challenges, defy yourself to become better and better. Are you alive just to live, our are you alive to make a difference in this world? Our take: Life has 2 sides, the negative side and the positive side. It's the way you look at things that determines which side will impact your life. Having a positive mindset it's crucial to be successful. Spend more time in the positive side for inspiration and motivation that will lead you to success.